smell is part of the Basic English 850. 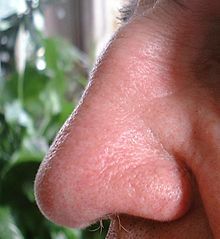 A nose that someone uses to smell things. To use the nose to sense something. She put her nose near the flowers and breathed in to smell them. She smelled the waste and felt sick. To gently put a substance that people can smell into the air. The flowers smell very good. The way a thing smells; the substance in the air that people can smell. The smell of the flowers is very good. This page was last edited on 24 April 2017, at 06:09.